Creating hyperlinks in field objects. 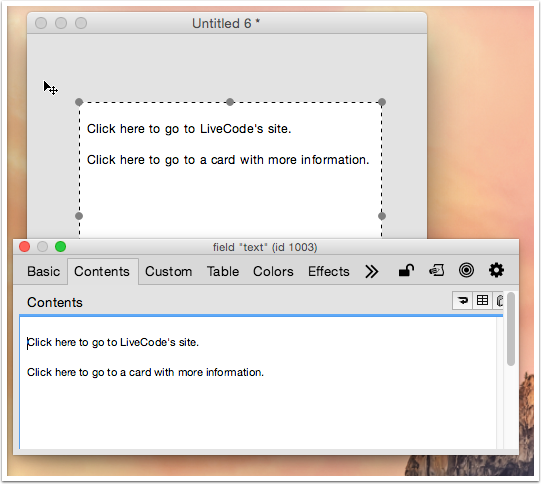 This tutorial explains how to use the textStyle and textLink properties to create hypertext links within a locked text field. 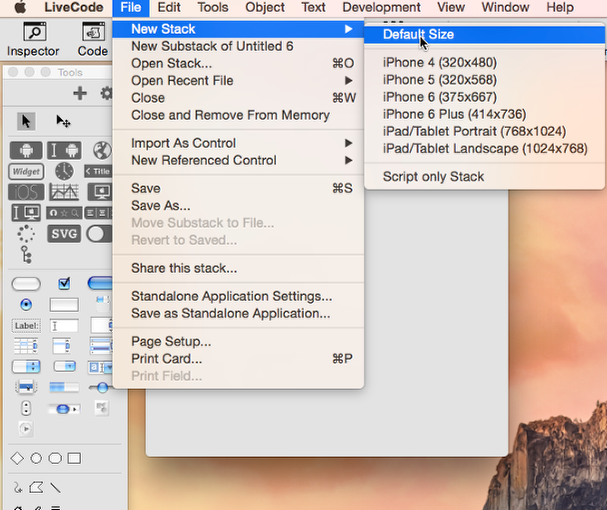 Launch LiveCode and create a new stack by opening it from the File menu. Create a text field that will contain the text which you wish to make into a hypertext link by click-dragging the field object creation tool on the tools palette over to your stack. 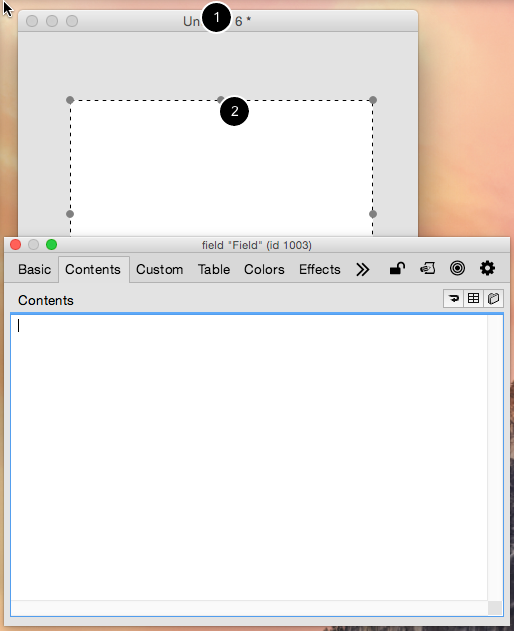 Resize the field using the selection handles to a suitable size for your stack. Adding text to your text field. Using the Object Inspector, name the field "text" or some such thing. While this step isn't really necessary, it is good practice to give objects names that are easily remembered. 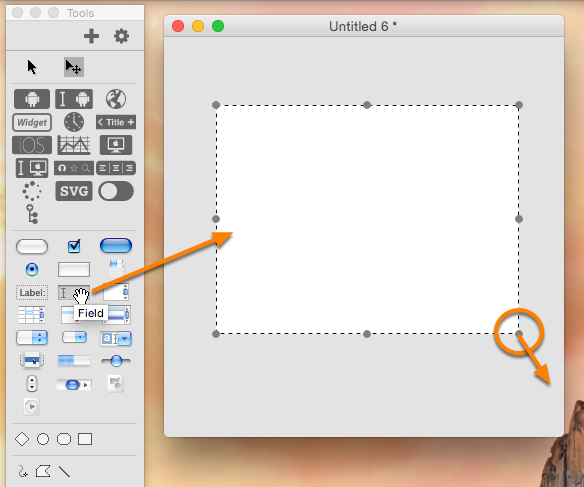 Setting the textStyle to link. This sets the second word of the first line as having a link textStyle. 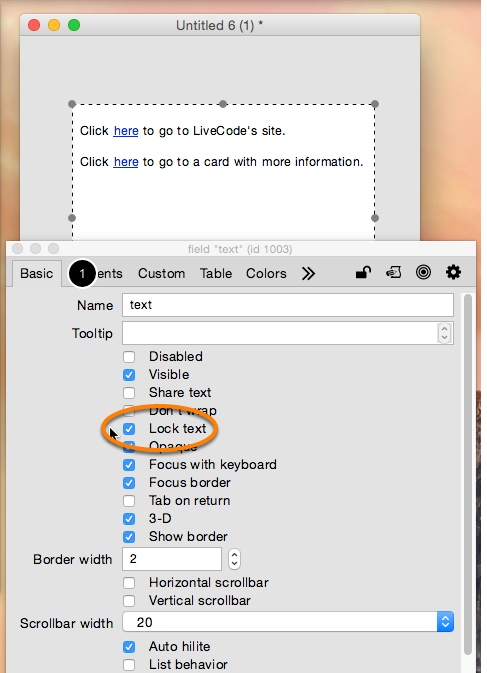 It should result in the indicated word having a blue, underlined, link appearance. Linking the link to a destination (website). 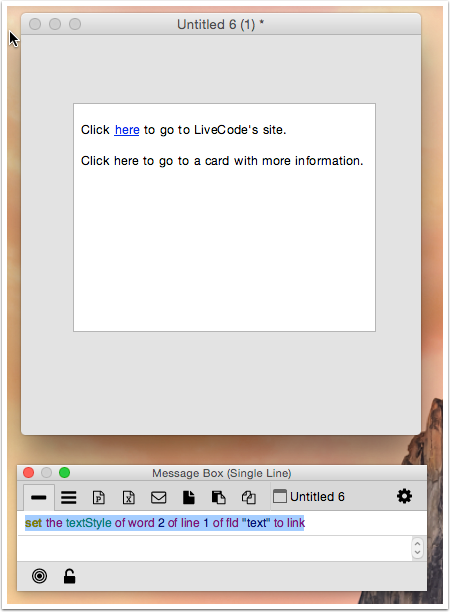 set the linkText of word 2 of fld "text" to "https://www.livecode.com"
This makes the link, when clicked, open a web browser that opens this URL. Repeat this process to underline the "here" on the second line, changing the chunk descriptor to reflect the second "here" in the text field. (Hint, it's on line 2). Linking the link to a destination (a card in your stack). 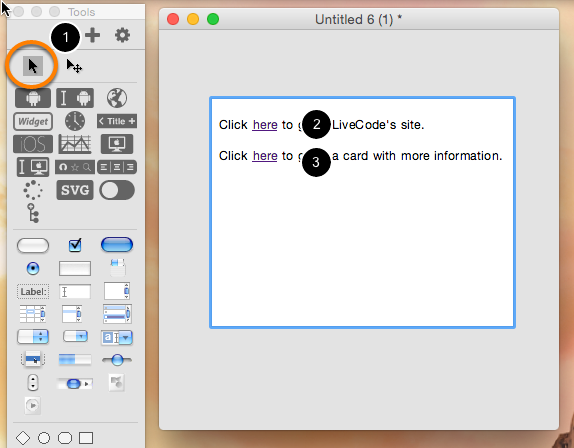 Repeat the instruction above to create a link for the second "here" but, instead of the URL, give the destination as "card 2" or whatever you have named card 2. 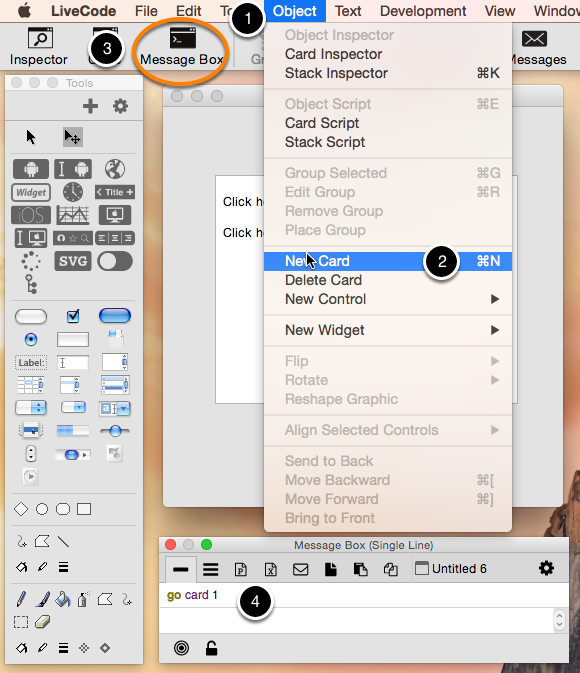 Lock the field "text" by right clicking on it, accessing its Property Inspector palette, and ticking the box titled "Lock text" on the Basic tab (1). We will now script the field to handle the links being clicked and directing the user to the desired location. 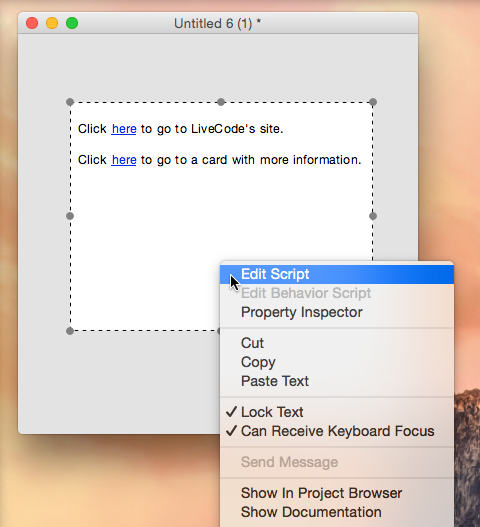 To do so, select the text field by right clicking, and select Edit Script. 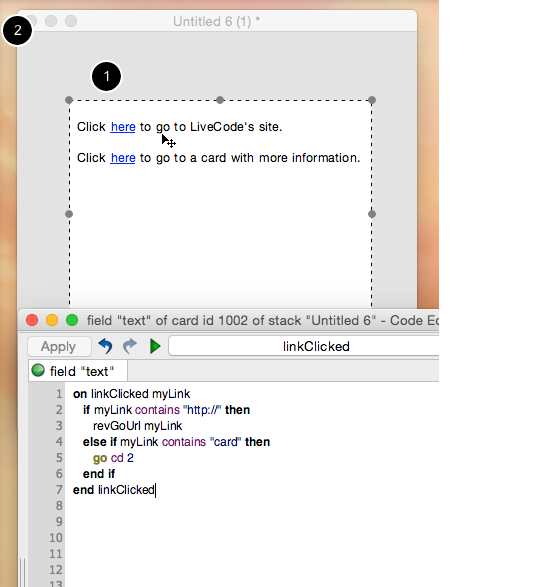 Prev: How do I scroll a card that is taller or wider than the window? Next: How do I use the same controls on multiple cards? I was doodling around with this lesson today, and while it works as expected, I also found that just enclosing the link in an href tag also works to launch it, i.e.